Luna is different, she has a secret. In a world where nearly everything is done online she remains unplugged. The pressure to join the crowd is great but she stays strong for a long time, until someone hands her a possible answer. Even online though there are things she must keep hidden for she is different and those differences are ones that could cost her her life. Luna plunges into a world that killed her mother and is fraught with dangers that few others seem to be able to perceive. Even amongst the hackers she is gifted and can do things no-one else can do. She wishes she knew why, that she understood what was going on but finding out those answers changes everything for her. Luna is an interesting character, her developing gifts make it difficult for her to be sure of her place as she finds she has abilities that no-one else has. She learns that everything she does is being watched. 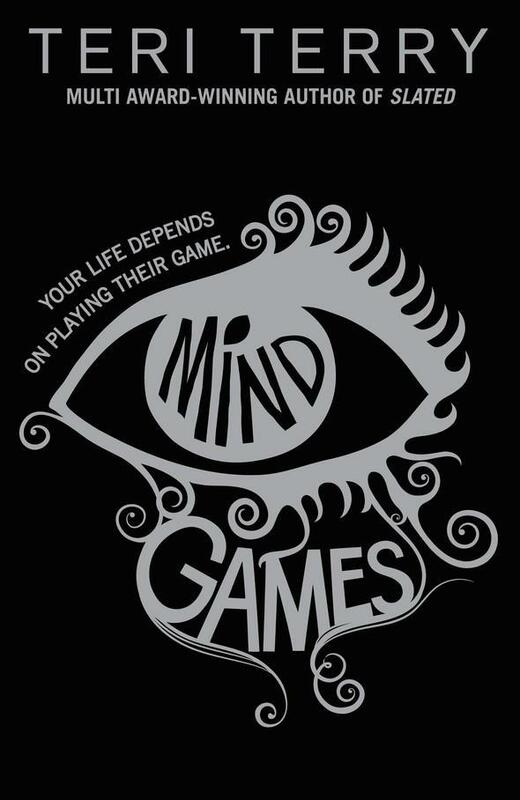 She doesn’t know who to trust, just when she thinks she has a grasp on it, things turn sideways. Luna has cause to be skeptical, every time she thinks she has a friend she can trust something happens to undermine that. The characters that come alongside her are an eclectic group of individuals all with their own agenda. It is an intriguing read. The world is how is could be if everything goes digital, the pros and cons. There were some fascinating concepts woven into this story and it could certainly be listed as a tale of caution about relying too much on technology. The only thing that threw me was that the author put in a reference to her own books, an action that seems to me to be self serving and a bit pretentious. That aside I would say this book is well worth investing the time to read. The day comes, the world falls apart, or at least the bits of it Pandora Jones can remember once she wakes in a hospital somewhere. She quickly finds out nearly everyone has become the victim of a terrible plague, a pandemic, and her family as well as most of humanity has gone. Pandora and a few others have been rescued and are now quarantined in a facility referred to as The School, by those who run it. Here they are being taught to start over and all that entails; limited food, power and no hot water. It is harsh but supposedly safe. Pandora can’t shake the feeling that something isn’t quite right. She is one of a team but she doesn’t know who to trust and when she steps out, taking a risk to discover something, anything, things don’t go as she planned. This is a dismal world Jonsberg has created. It’s dark undertones draw you in. The central characters all suffer nightmares of the things they remember of that final day, no one really wants to talk about them. Pandora is one of the students who believes it shouldn’t just be about survival of the fittest, she stands for her beliefs that art is important as are other things because they are what make us human. 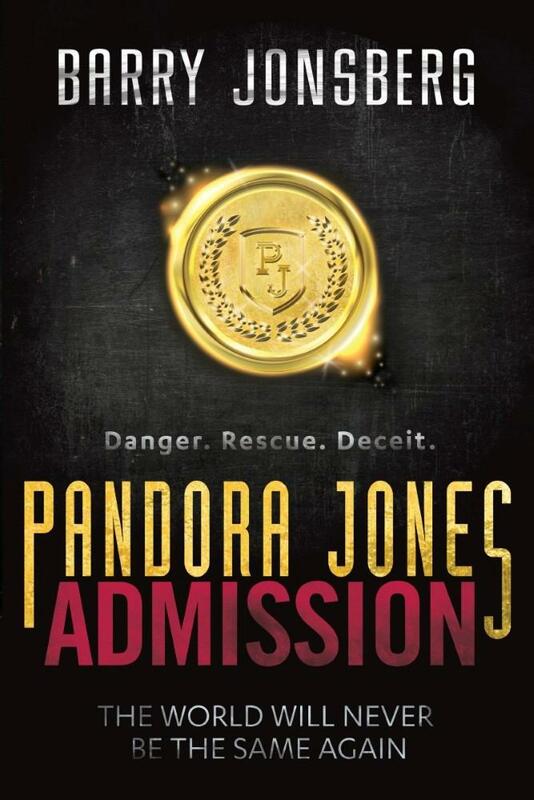 Pandora’s ethics are central to her character, her drive to discover what is really happening and to question the way things are done around her. Her gift is a strange one, Pandora can find things, and this isn’t necessarily a good thing because more than anyone else’s gift (which are in the more normal spectrum of things) her psychic ability sets her apart. There are interesting dynamics being developed between some of the charters who surround her, most noticeably Jen, who is the one who clashes with Pan the most. It is a dark tale, set in a dark and hidden world. Hidden in as much as we only know what Pandora knows and there is so much that is kept from her. Pan’s strong moral centre and unique ability makes for an interesting character and I am curious to see where this series goes, where her character goes. Okay, so this book is one of those Must Read books on so many YA lists. It is even one that has made school lists. Sadly it is still on my massive to be read pile. This trailer has made me more interested in reading it though and that can’t be a bad thing. Before viewing I will say some of the comments I read about the trailer lead me to think it contains spoilers so be forewarned. Born badly deformed Modo was bought from a traveling freak show when still very young. Bought up in seclusion he only has contact with those who are training him to be a special agent. Modo has no contact with the outside world until he turns 14 and is taken to London. His first task is to learn to survive unaided in an unknown, even hostile, environment. 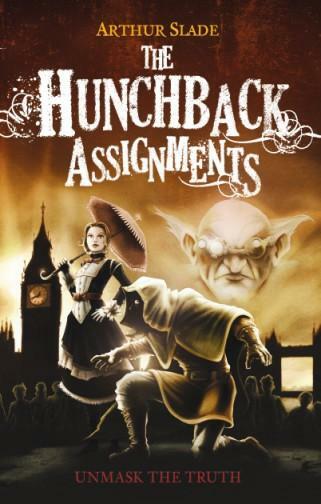 Before long his ability to shapeshift and travel easily across the rooftops of London has him investigating The Young Londoners Exploratory Society. This in turn leads him to the mysterious Clockwork Guild, a secret organisation who are planning something devastating for the country. Mixed up with all of this is the strange disappearances of many children. Teaming up with another young agent, Octavia Milkweed, Modo is plunged into a dark world filled with evil figures who will stop at nothing to see their plans realised. A darkly twisting adventure story, filled with mystery and action. Modo is a fascinating character, well trained with a deep running torment. He is at times clever, at times innocent and his motivations are more pure than those of his handler. Octavia is a good counterpoint for Modo; brash, bold and roughly raised, she learnt to survive on her own from a very young age. These two make for an interesting pairing. Slade’s London is well depicted, gritty and layered. The good guys are good but definitely not shallow in their characterisation, and the bad guys are very twisted and bad. An excellent read for any steampunk fan. Power hungry, evil pixie Opal Koboi is back, she is far from done, and is now plotting to get rid of all mankind in her quest to become the fairy queen. It is an ambitious and heartless plan, she cares nothing for those she uses and less for those who will die. The icing on the cake will be to take down Artemis, Holly and Foaly. This is very personal for her. Artemis and his friends aren’t about to let this happen without a fight, especially when it appears Opal has found a way to drag Artemis’ two four year old brothers into her plotting. This is not how it was supposed to end. Will Artemis be able to come up with a plan to foil Opal and prevent the end of the world? 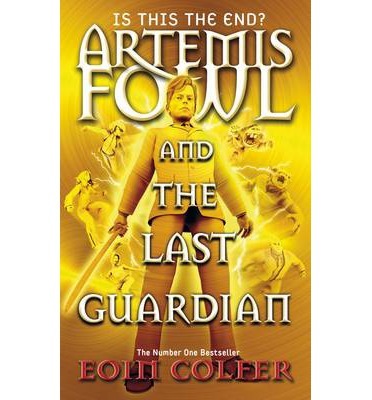 A fitting end to the anti-hero that is Artemis Fowl. Artemis is a great character, clever and so much fun. Holly is a wonderful partner; brave, brazen and as determined as the young human. Foaly brings a great element of fun and Butler grounds it all in humanity. Together these core characters have taken us through some great adventures and this is no exception. Colfer has delivered an entertaining final chapter set in a place that stands apart in its blend of magic, technology and the world as we know it. The way he has been able to have to two worlds function separately yet be part of the same thing has been a joy to read, and lets face it who wouldn’t love to read about a boy billionaire/evil genius. The camaraderie and bonds between the characters have been well established over previous books and he doesn’t let these foundations slip as he takes us to its conclusion. 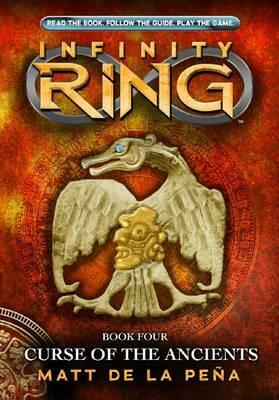 I have been a fan of these books for years and still think they are great fun, I’m sad to see the series end but it was a good place and way to do so. I am looking forward to Colfer’s next book. Okay the thing is I am a fan girl, actors/authors/characters, and I love it. I am totally unashamed of this part of my personality. A great thing about being me is I know plenty of others who indulge in geekdom and fandom as well. I was not alone this weekend, in fact SuperNova Perth had it’s biggest weekend there ever. It was huge and so much fun. Why am I posting this you may wonder? Well because the sci-fi/fantasy fans are the best. We are avid and passionate. For many of us it starts at a young age, books/comics we love it and we devour it. This weekend I saw cartoon characters, movie characters, comic book characters, tv show characters, game characters and book characters. Now is the time I will point out that a great many of these characters come from written word formats in one way or another. If you have kids who are avid readers and you want something to challenge them but will not have inappropriate themes, then often fantasy is a good place to go (not George RR Martin though). If you have reluctant readers give them a comic book. 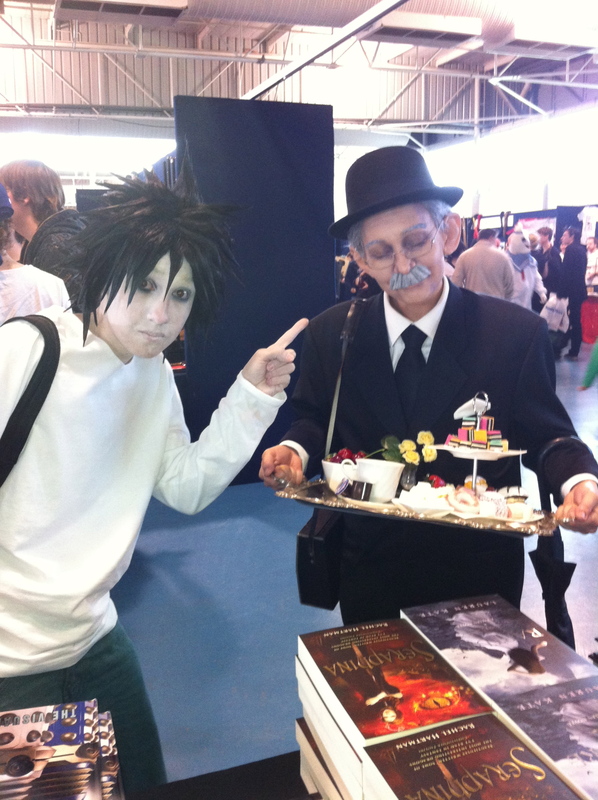 Reading is reading, and that is a good thing, and conventions are a great place to realise just how great it can be to escape for just a little while. 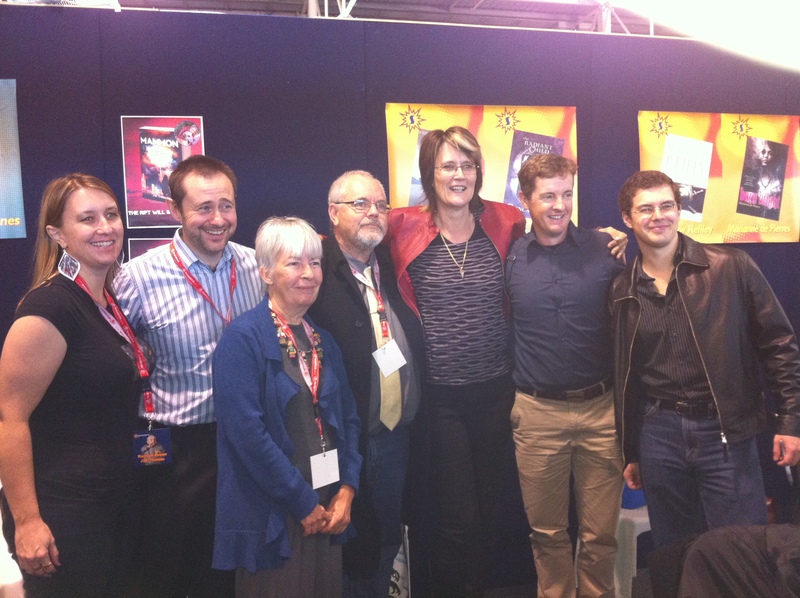 A convention is also a great place to meet authors and get your favourite book/s signed and even find some new authors to try. 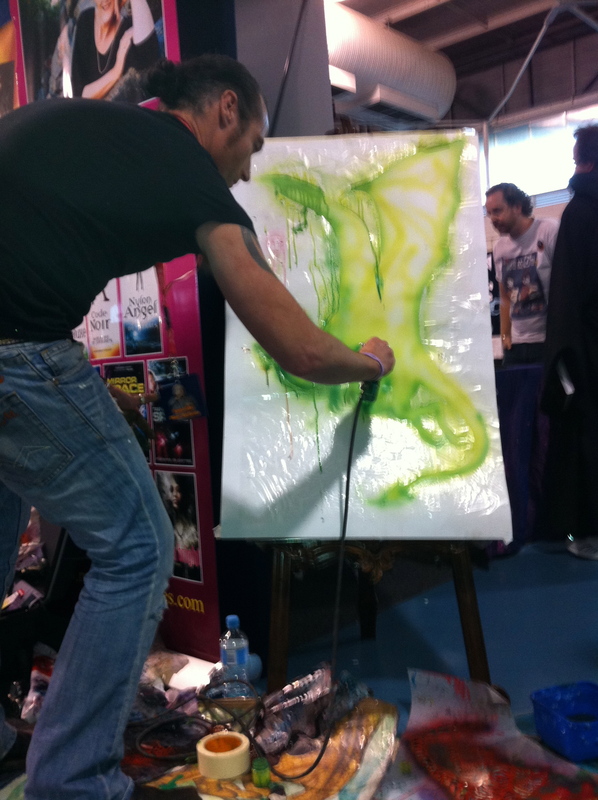 Or see illustrators/artists in action. 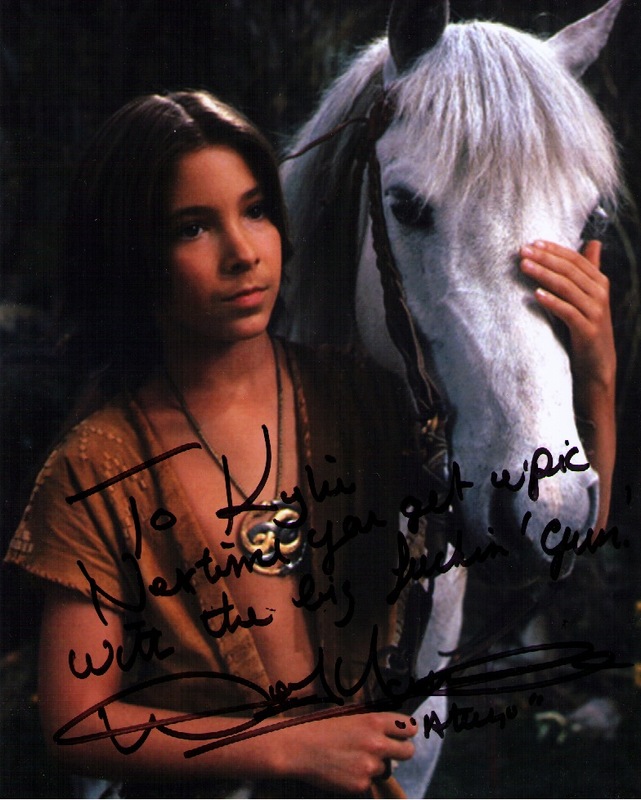 One of my highlights was meeting Noah Hathaway who played Atreyu in the film version of one of my fave books as a kid The NeverEnding Story. My signed pic…I totally geeked out over this. We who are prepared to geek out salute you!! !